On this primary voting day for Montanans, we need to elect leaders who will guide and help us create a sustainable future. To this end, we can learn from others, important ideas and techniques. Many are in denial that our current way of living and treating the planet is not sustainable, and delays progress. But there are others who have taken a leadership role in this primal work of restoring lands and water systems ruined by the hands of man. 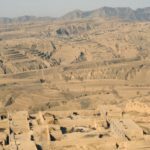 One such important project comes from China’s Loess Plateau at the headwaters of the great Yellow River. Watch and be inspired by this documentary on YouTube. Short (10 minute) and long (52 minute) versions follow. See also my synopsis, below. Click on the YouTube icon in the lower right corner to view either video full screen (or copy and paste the link in ‘References’ below into your web browser). This will make it easier to read the English subtitles/captions. You can also view related videos (displayed on the YouTube page) of other communities who are putting the lessons learned at Loess to work for them, such as the 6-minute ‘Reversing Desertification in Sahel: Using Lessons from the Loess Plateau’ (4). This focuses on the problem, with only a summary of what they accomplished. See also EEMP (Environmental Education Media Project): Lessons of the Loess Plateau (2). In the 1990s, a group of Chinese researchers/activists studied different parts of the plateau for several years, taking notes and then coming up with a plan. They allocated plots to each resident family, and paid them to do the work to restore their plots, to add incentive and a sense of ownership. To help stop the massive soil erosion of the denuded soil, and to act as carbon sinks, they planted trees especially fruit trees in the newly terraced fields. To hold onto the rainwater for crops, and to stop erosion, they created stable terraces for growing crops and gardens. To stabilize the dunes, a special type of planting protects the soil from the blowing winds. To save the burgeoning new life in the soil, they stopped tilling. To retain water for crops and encourage the return of native wildlife, they built small dams (like beavers might do) which created healthy ponds. To produce crops in the off-season, the constructed large greenhouses. Over the next 20 years, the residents saw positive results of their labors, which incentivized them to continue, and to educate their children. Poverty was greatly reduced as most families were earning enough from sale of their produce to support themselves and their families, and to move out of cave homes into new brick homes with electricity and running water. Here in Montana, ranching communities east of the divide are experimenting with ‘grass banks,’ allowing their livestock to graze in a pasture, then move them on to another pasture before the previous one is denuded (see my earlier post: Importance of Regenerative Agriculture for more about these experiments). This is to mimic how the large buffalo herds kept our great prairies alive before those herds were obliterated. At first glance, the farmers in the Loess experiment are doing the opposite by confining their herds into feeding enclosures. But the reality is that the grass-bank experiment is quite similar, in that the herds are moved before their feeding becomes destructive. Another issue is the open grazing of the livestock naturally fertilizes the soil, that doesn’t happen when they are penned. However, it is likely the farmers save the manure to spread on their fields and terraces, rather than relying on chemical fertilizers. This entry was posted on Tuesday, June 7th, 2016 at 11:35 am and is filed under Agriculture, Community, Ecology, Survival; Primitive Living. You can follow any responses to this entry through the RSS 2.0 feed. Responses are currently closed, but you can trackback from your own site.